(For the 70s British rock band, see Mr Big.) Mr. Big combined two popular musical trends of the rock scene in the 1980s: a particular brand of hard rock, focused on melodies and listener-friendly choruses, and impressive technical proficiency, then called shredding. The seeds for the group were sown when bass player Billy Sheehan (considered one of the top bassists of rock, often thought to be the bass equivalent of guitarist Eddie Van Halen) left David Lee Roth's solo band in 1988. Mr. Big combined two popular musical trends of the rock scene in the 1980s: a particular brand of hard rock, focused on melodies and listener-friendly choruses, and impressive technical proficiency, then called shredding. The seeds for the group were sown when bass player Billy Sheehan (considered one of the top bassists of rock, often thought to be the bass equivalent of guitarist Eddie Van Halen) left David Lee Roth's solo band in 1988. Almost immediately after his exit, Sheehan began piecing together a new outfit, with the help of Mike Varney from Shrapnel Records, a label specialized in the shredding genre. The band comprised Shrapnel artist and former Racer X guitarist Paul Gilbert, Pat Torpey on drums, and singer Eric Martin, who had a number of album releases throughout the 1980s with his Eric Martin Band. By 1989, the newly formed quartet had already inked a recording contract with Atlantic, resulting in the release of a self-titled debut the same year. Despite causing a buzz amongst musicians, the album failed to crossover to a mainstream rock audience stateside; however, Mr. Big was an immediate smash success overseas in Japan. 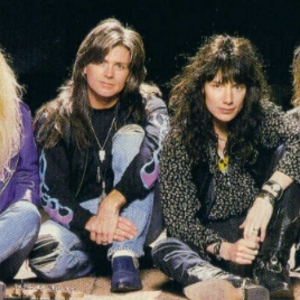 The band's breakthrough came with their second album, Lean Into It, in 1991. It featured two ballads that established the band as a commercial success: To Be With You and Just Take My Heart, as well as rock songs that remained as staples of their live set for years to come, such as Green-Tinted Sixties Mind. Other releases followed, Bump Ahead in 1993 and Hey Man in 1996, but the band never replicated its earlier success in the US market. In Japan, on the other hand, they continued to sell out tours, resulting in a number of live releases for the Japanese market throughout their career (from Raw Like Sushi in 1990 to Mr. Big in Japan in 2002). Paul Gilbert left the band in 1997 to pursue a solo career and eventually reform Racer X. Richie Kotzen, another Shrapnel artist and former guitarist for Poison, was brought in to take on guitar duties, also contributing occasional vocals. Two studio albums were released by this lineup: Get Over It in 2000 and Actual Size in 2001, which featured the single Shine used in the anime Hellsing. Tensions in the band between Billy Sheehan and the other members, especially Eric Martin, led to the band's demise -- contractual obligations for yet another Japanese tour were fulfilled in the form of a "farewell tour". The multi-million record-selling band broke up in 2002, many years since their last hit in the United States, but while still enjoying great popularity in Japan. In February 2009, as a result of fan-demand and also after several coincidences over the past couple of years that have gradually brought the group back together again, Eric Martin, Pat Torpey, Paul Gilbert, and Billy Sheehan finally announced their decision to reunite. This announcement was marked with celebration and excitement amongst fans all over the world, especially in Japan. The band members themselves are very happy to be together again as friends, and to perform once more for fans all over the world. Their first tour is in Japan in June 2009.